SCANDALicious sounds good to me!! CANTAcious sounds like some kind of octopus for me!! Scandalous or maybe Cagayake Girls? Yassu wrote: I see that you take as base always "SCANDAL" or only a member of SCANDAL, so why not try another thing? What do you think about CANTAcious? I know this word not exist but for SCANDAL, I think a new word must be invented. So as Canta represent SCANDAL, I though I can take this name for talk about a fan of SCANDAL. CANTAcious sounds ok to me, how about SCANTA? I think SCANTA looks too much to CANTA. For me the problem about SCANDALicious is that it's too simple. I mean, there isn't a true originality: you have taken the name of the band, add "cious" and it's all, moreover everyone can guess that a "SCANDALicious" is a fan of SCANDAL. Contrary to CANTAcious, I confess I've had "cious" too, but only the fans of SCANDAL know CANTA. So I think you want to ask me why "CANTA"? I reply that, as I've already say, CANTA represent SCANDAL,furthermore, when I've looked the "PV of Koshi-Tantan" I've noticed the CANTA below the girls, and I thought these CANTA represent us. It's the reason why I have choose to put "CANTA" and "cious" for it looks like an adjective. So what think the persons below me? Yassu wrote: For me the problem about SCANDALicious is that it's too simple. I mean, there isn't a true originality: you have taken the name of the band, add "cious" and it's all, moreover everyone can guess that a "SCANDALicious" is a fan of SCANDAL. Contrary to CANTAcious, I confess I've had "cious" too, but only the fans of SCANDAL know CANTA. I agree, SCANTA is too similar to CANTA since CANTA means SCANDAL-taro. This is just my opinion, taro is a boyish name, so we might find girlish name for girl fan. 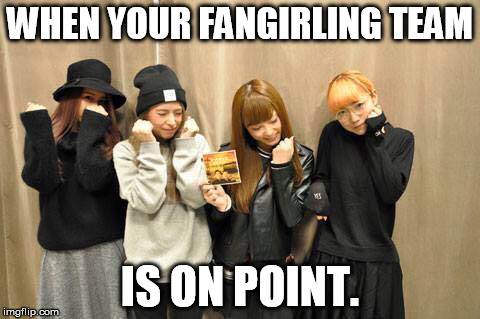 But basically, I 100% support your opinion, it's true the canta in Koshi-Tantan PV represent us. I think Cantacious is a great idea ! I think Scandal fan is enough...so many bands call people other things...for example Hollywood undead: HU soldiers or Army of the dead...Lady Gaga calls her fans her monsters. What's so wrong with just being a Scandal fan? Do we really need a special name? Does it mean we don't like them as much if we don't have a special name? Its just my opinion though. Eri08 wrote: I think Scandal fan is enough...so many bands call people other things...for example Hollywood undead: HU soldiers or Army of the dead...Lady Gaga calls her fans her monsters. What's so wrong with just being a Scandal fan? Do we really need a special name? Does it mean we don't like them as much if we don't have a special name? Its just my opinion though. Yeah, I agree with you. We, SCANDAL fans should really have a name of our own since we are highly increasing. It's part of every popular girl band/group to have an official fanclub. hmm what about... fanDAL fan of SCANDAL? hhmmm. I think I call myself a Scanner:P.
i'm a scandaler or something like that. The fact that you listen to a good chunk of their songs, and maybe purchased an album would make you a fan. A TRUE fan I would say, would like ALL their songs. I only like a select few, like Doll, Want You, Tokyo Skyscraper, and a few more. I have Baby Action, and my Harukaze is coming. Then again, the only group that I have EVERY album for, and loved all their songs was Linkin Park. lol, though it doesn't sound right!!!! I think being a SCANDAL fan is good enough.... in my opinion " I'm a fan" is better than " I'm a ____"
no seriously, I'm totally okay with just being a "scandal fan", but scanta didn't even sound so bad.